India, a country in South Asia bordered by Pakistan, Bhutan, China, Nepal, Bangladesh, Burma, the Indian Ocean, the Arabian Sea, and the Bay of Bengal has a total land area of 1,269,210 square miles and a population of around 1.19 billion. India is the second most populated country and one of the fastest growing economies of the world. Its terrain is highly diverse – mountains, deserts, plateaus, plains, coastal regions, deltas, and with tropical, deciduos, coniferous, thorn, and mangrove forests. It is a land of various cultures, ethnicities and languages. Its biodiversity is significant with a high level of endemism and it has many protected habitats.. The economic model of India has, in the last two decades, evolved into a capitalist one. India ranks high in its military capabilities. The major sectors of its economy are services, agriculture and industry. The challenges to overcome are poverty, illiteracy, and corruption. 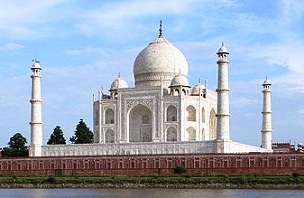 October through February is considered the best time to visit India. As these months also coincide with the various festivals it enables visitors to partake in the festivities in true Indian tradition. Its attractions are varied – monuments, national parks, beaches, temples, forts, palaces, caves, backwaters, lakes, waterfalls, etc. India has many World Heritage Sites to its credit, which includes Taj Mahal, Agra Fort, Konark Sun Temple, Fatehpur Sikri, Kaziranga National Park, Qutub Minar, and the Valley of Flowers. The cuisine of India is an art, for it involves the blend of various spices in various proportions. Sizable population are vegetarians. A typical meal is a combination of starch, carbohydrates, protein, vegetables, and fruits. Nan (flatbread), dosa, biryani (spiced rice), chicken masala, fish curries, dal makhani (lentil dish), and palak paneer (spinach with cheese cubes) are some of the popular Indian dishes. India Lonely Planet Country Guide 978-1741791518 $20 Over 1200 pages and 250 maps! A traveler’s introduction covering 120 pages followed by sections on Delhi, Rajasthan, Haryana and Punjab, Jammu and Kashmir, Himachal Pradesh, Uttar Pradesh, Uttarakhand, Kolkata, West Bengal, Bihar and Jharkhand, Sikkim, Northeast States, Orissa, Madhya Pradesh and Chhattisgarh, Gujarat, Mumbai, Maharashtra, Goa, Karnataka, Andhra Pradesh, Kerala, Tamil Nadu, and the Andaman and Nicobar Islands. India Travel Map 978-1553412564 $13 1:2,100,000 Scale. Includes insets with central New Delhi Street Plan and overview maps of Mumbai and Kolkata. The first stamps of India were a set of six stamps released in 1854 in five different designs in the Queen Victoria (QV) theme. The imperforate set (Scott #1 to #6) is rare. The most valuable is the 4a red and blue cataloging for around $4500 mint. A head inverted variety of this stamp exists and that can fetch as high as $90K. A number of different designs on the QV theme along with certain overprints were the primary stamp issues of India until the turn of the century. The early QV issues are all valuable. King George V (KGV) theme replaced the QV theme with the released of a long set (Scott #60 to #75) between 1902 and 1909. That set is also very valuable and catalogs for around $440 mint and $150 used. Following the establishment of trading posts by European powers from the 16th century, the British East India Company controlled most of India by the mid-nineteenth century. It was brought under the direct rule of British Crown following the Sepoy Mutiny of 1857. India released another long set of nineteen stamps in the KGV theme between 1911 and 1923. That set (Scott #80 to #98) is also sought after and catalogs for around $500 mint and around $100 used . KGV was the primary theme of Indian issues till 1937. Two other sets were released in the interim: A set of six stamps (Scott #129 to 134) released on February 9, 1931 to mark the change of seat of government from Calcutta to New Delhi and a set of seven stamps (Scott #142 to #148) released in 1935 to mark the 25th anniversary of the reign of KGV. The sets are relatively inexpensive: the first one catalogs for around $20 mint and $40 used while the latter set catalogs for around $12 mint and around $5 used. India released a long set of nineteen stamps between 1937 and 1940 in the Mail Transport theme. That set (Scott #150 to #167) is sought after and catalogs for around $200 Mint and $90 Used. The designs show runner, bullock cart, tonga, camel, mail train, mail steamer, mail truck, and mail plane. A set of four stamps released on August 15, 1948 showing Mohandas Karamchand Gandhi. The set (Scott #203 to #206) catalogs for around $80 MNH and $40 Used. Gandhi was the leader of Indian independence movement and is regarded as the father of the nation. There is a very rare variety of the 10r Gandhi with a service overprint – only 100 copies are known to exist and so those catalog in the $10K range. India became independent on August 15, 1947 and a set of three stamps was released to mark the event. The set (Scott #200 to #202) is remarkably inexpensive and catalogs in the $5 range. An architecture set (Scott #207 to #222) was released in 1949 and that is sought after. The set catalogs for around $140 MNH and $30 used. A set of six stamps released between 1962 and 1963 in the Animals theme. The set (Scott #361A to #366) catalogs for around $20 MNH and $5 used. The designs show rhinoceros, gaur, lesser panda, elephant, tiger, and lion. India is home to 7.6% of all mammalian species. Threatened species from this set include the Asiatic Lion and the Bengal Tiger. A set of four stamps released on December 31, 1968 in the Birds theme. The set (Scott #480 to #483) catalogs for around $6 MNH and a little less for used. The designs show redbilled blue magpie, brown-fronted pied woodpecker, slaty-header scimitar babbler, and yellow-backed sunbirds. A sister set of four stamps (Scott #656 to #659) was released on April 28, 1975. The designs show bluewinged pitta, black-headed oriole, western tragopan, and Himalayan monal pheasant. The set catalogs for around $9 MNH or used. India is classified as one of the seventeen megadiverse countries and is home to 12.6% of all avian species. A stamp released on October 8, 1982 to mark the 50th anniversary of the Indian Air Force. The stamp (Scott #989) catalogs for around $5 MNH and around a dollar for used. It shows the Westland Wapiti and the MiG 25. Westland Wapiti was a British two-seat single-engined biplane used in the Royal Indian Air Force until 1939. MiG 25 was part of the Indian Air Force from 1981 to 2006. This Russian aircraft was a high-supersonic interceptor and reconnaissance-bomber aircraft that was the fastest military aircraft at the time of its launch into service in 1970. Another stamp in the aviation theme was released on October 15, 1982 to mark the 50the anniversary of Civil Aviation (Scott #990) and that catalogs for around $5 MNH and $2 used. It shows Jehangir Ratanji Dadabhoy Tata and his Puss Moth, a three seater high-wing monoplane. A set of four stamps released on November 23, 1994 in the Endangered Waterbirds theme. The set (Scott #1501 to #1504) catalogs for around $50 MNH or used. The designs show Andaman teal, Eastern white stork, black-necked crane, and pink-headed duck. The reason for the unusually high pricing has to do with the fact that the set was withdrawn after issue when it was discovered that the set was printed with water soluble ink. Coins of India dates all the way back to around 400 BC a few centuries following the first Greek coins of Lydia dated at 640 BC. The first gold coin was a Dinar showing the image of Lord Shiva issued around 100 AD. Over the years, there have been a large number of denominations from the different princely states and independent kingdoms. Each of those forms a good collectible theme on their own. British Colonial Copper Annas were first issued by the East India Company in 1835. The issues generally have very high mintage into the 10s of millions and are valued in the $10 range for UNC. Proofs are however valued into the 100s. Standard Coinage of the Republic Era commenced with the introduction of Bronze Pices in 1950. The design shows Asoka Lion Pedestal in Obverse and a Horse, Date, and Denomination in Reverse. The issue catalogs for around $5 BU. Ancient Coins $5 and up Bronze and Copper coins from the 500AD through 800AD, Silver Drachms from between 200AD and 500AD, etc starts around $5. South Indian, Kashmiri, and Delhi coinage from the 9th to 10th century periods start around $10. Silver Drachms from 300BC and prior dates start around $30. Mughal Era rare Rupees in VF, Silver Tankas from Gulbarga, Bengal, etc from around the 14th century, etc starts around $75. Rare coins from the first century of Indian coins (500BC), Ancient Gold Coins, etc go well into the 100s. Other Coins $1 and up Common UNCs starts around $1. 1960s Asoka Lions in UNC, 2010 Mother Theresa Commemorative in UNC, KGV Issues from the 1910s in VF, etc starts around $5. Bronze Mysore Cash from the mid-nineteenth century in VF, Portuguese Indian Thick Copper issues from the early 19th century, etc starts around $15. 100-piece recent commemorative lots, Silver Rupias in BU from the early 20th century etc start around $100. Gold Sovereigns, Proof sets, etc go well into the 100s and 1000s. Bullion $15 and up Silver bullion bars 5 grams and up starts around $15. Silver Art Bar with Semi-precious gemstone starts around $50. Gold Bullion Sovereigns go well into the 100s. Paper Money $1 and up Common UNC notes starts around $1. Year sets start around $15. UNC Bundles start around $50. Scarce two-rupee banknotes from the 60s showing Fauna in UNC, First Number Bundles, Error Varieties, Portuguese India Rare Banknotes in VF, etc go well into the 100s. Scarce KGV issues from the early 20th century in VF, Rare Varieties of Portuguese India Tangas, etc go into the 1000s. Indian tea, bangles, scarves, shawls, sarees, outfits, spices, henna, incense, sandalwood, etc., are some souvenirs from India. Art $1 and up Vintage wallpapers and postcards start around $1. 19th century historically relevant photos and prints start around $30. Ravi Varma prints and original art works by Suhas Roy, AP Santhanaraj, Partha Pratim, Gopikrishna, etc go well into the 100s and 1000s. Antiques $10 and up 19th century maps, silver plated teapots and other utensils, etc start around $10. Vintage Hand Painted Silk Paintings start around $50. Jaipur Handmade Rugs, Mughal Period Curios, etc go well into the 100s and 1000s. Jewelry $1 and up Agate Pendants start around $1. Marble Inlay Jewelry Boxes and other Curios start around $40. Red Star Rubies over 3ct, Garnet and Carnelian Necklaces, Onyx Rings and Necklaces, etc go into the 100s. Opal and Diamond Rings, 22k gold jewelry, etc go well into the 1000s. Miscellaneous Collectibles $1 and up Raksha Medals and postcards start around $1. Agate Figurines start around $5. Brass Gongs, Rosewood Himalayan Crystal Healing Sticks, Yak Bone Trinket Boxes etc start around $40. Tantric Lingam Stones, Old Litho Hindu Mythology Prints, etc start around $50 and go into the $100 range. Vintage Dagger Knifes, Swords, 19th century medals, old brass lunch boxes etc go well into the 100s.